4" JOBOX Casters, Set of 4, Catalog Number 1-320990. Pemco Anti Static Shopping Cart Caster 5" x 1-1/4"
Pemco Anti Static "KasterKat" 5" Shopping Cart Casters w/ threaded stem fit most shopping carts and are a quality replacement or OEM option. Casters and wheels are necessary for all types of projects and with many options and styles to choose from. From shopping carts to storage bins, casters can help people keep their items mobile and accessible while in use. 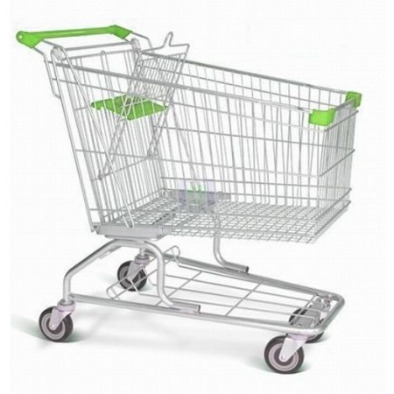 For instance, the Pemco "KasterKat" 5" shopping cart caster and wheel will fit most shopping carts and can be an excellent replacement for OEM parts. These threaded stem casters are durable and made to withstand a variety of conditions that grocery carts endure. When you shop for industrial casters, check out the heavy duty casters that are often associated with the the Buy Casters brand. Our company also offers numerous different configurations of casters in most sizes and styles, like specialty low profile swivel light duty casters that can be combined with a special top plate wheel combination. Some casters and wheels feature special mechanisms that can help to keep them stationary if you don't want the apparatus in motion. These locking casters have several different types like "total lock" which locks the swivel and the wheel. The "Top Lock" which applies a brake lever on the top of the wheel and the "Cam Brake" which squeezes the caster legs on the wheel to prevent movement. Several bearing options are available as well Roller bearing is the most common, Delrin, Precision sealed bearings and tapered bearings for heavy duty applications, most bearings are available in stainless steel as well. Many wheel colors are available also. All of these options are available on the product detail page in a drop down menu to the left of the picture. Buy Casters also offers pre-packaged caster kits for Rubbermaid products, Metro Shelving, and office chair, furniture and displays. These kits have 4 or 5 casters and wheels per pack at a discounted price. What is a Caster and where are they used? Look around casters are every where... Hospitals, grocery stores, offices, industrial plants, delivery and warehouse just to name a few. 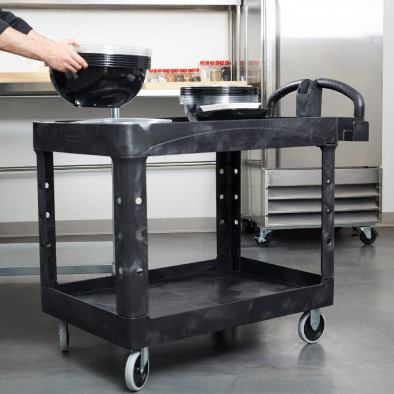 A caster (or castor) is an undriven, single, double, or compound wheel that is designed to be mounted to the bottom of a larger object, like a cart, chair or equipment, so as to enable that object to be easily moved. They are available in various sizes, and are commonly made of steel, rubber, plastic, nylon, aluminum, or stainless steel. Casters are found in numerous applications, including shopping carts, office chairs, and material handling equipment. High capacity, heavy duty casters are used in many industrial applications, such as platform trucks, carts, assemblies, and tow lines in plants. Generally, casters operate well on smooth and flat surfaces. Rigid Casters: A wheel mounted to a stationary fork with an axle and nut that allows the cart or equipment to roll but will restrict lateral movement. Swivel Casters: Similar to the rigid in that it is a wheel mounted to a fork, but the swivel will have a pivot to allow the wheel to rotate freely to help with movement and steering. Locking Caster: Locking casters are usually but not always swivel. These casters are equipped with a brake mechanism to prevent the wheel from rolling when activated.